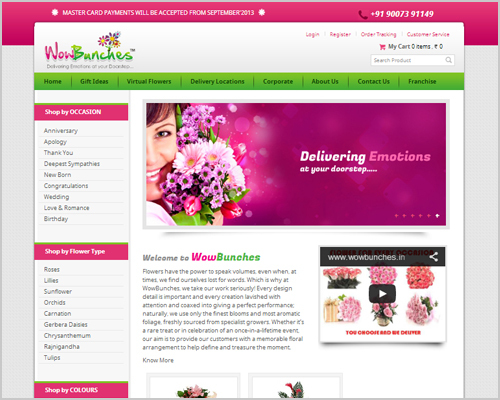 This time, WebGuru has created a niche by executing yet another wonderfully designed e-commerce website, wowbunches.in. Our experienced and skilled team of PHP developers has developed the website of the online flower delivery shop that stands as a magnificent brilliance indeed. The website offers a wonderful exhibition of the flowers and other gift items at the background that consumers can buy online. Consumers can have a quick look at the products available along with the prices and make an easy and quick buy of a product suiting their choice. The product exhibition page is an added bonus that lets you pick and choose carefully. You can also shop by occasion, flower types, colors, and prices. Such an extensive range of shopping options makes it easy for you to navigate and make the final choice. Following the order placement, you can also keep a track of your order. Moreover, the payment options are multiple and 100 per cent safe and secure. In addition, the smart and wonderful design offers complete satisfaction; you feel like shopping through a traditional shop. Check out the site; spread love and happiness all around. Excellent pieces. Keep posting such kind of information on your site. I am really impressed by it. I am a regular visitor,This piece of writing posted at this site is really fastidious.